6 July was mine and Kieron’s final day riding together for ‘operation get Mieke to the wedding’, from Bressuire to Annepont, France. The previous two day’s riding had racked up just under 400kms and over 3,000m elevation, so we set off weary and wobbly, but excited for the day ahead. Due to my bum soreness, I decided to practice standing up going up hill, as for the past two days I had stayed sitting. In our first 10 minutes of riding, we approached the first incline. The sun was beating down, we felt relatively well rested, and I was saying out loud to Kieron, ‘today is going to be a great day.’ Seconds later….snap. My chain had broken! I couldn’t believe it. There was nothing we could do apart from finding the closest bike shop to us and push/walk our way there. Luckily we were in the largest town we had stayed in all week and yes, there was a bike shop, Velo Cite within just under 45 minutes walk/push. I stayed on my bike on the downhill, Kieron pushing me up some of the uphill and the rest we walked. We arrived only to find that it was the sorting office for the bike shop and not the actual bike shop. A helpful shop assistant drew a map of how to get to the bike shop for repairs. So we set off again ever so hopeful for a quick fix! Velo Cite bike shop was great, large with lots of room and half a dozen mechanics to see us straight away. Whilst my bike was being fixed, we shopped and made use of the nice toilet with hand wash! Thanks team Velo Cite for putting on a new chain for me so quickly! The bike fix had set us back a solid 2 hours. We weren’t phased as our ride was a shorter one at around 130km and we just said, ‘we’ll get there when we get there.’ I was trying to arrive to catch the tail end of Mandy and Chris’s pool party pre-wedding day celebrations but knew I would be cutting it fine, so sent my WhatsApp apologies and we set off on our way again. The ride was hot, humid and hilly. At every opportunity we could, we cooled down. At cemeteries (weird I know, but they all have taps!) and local farms. 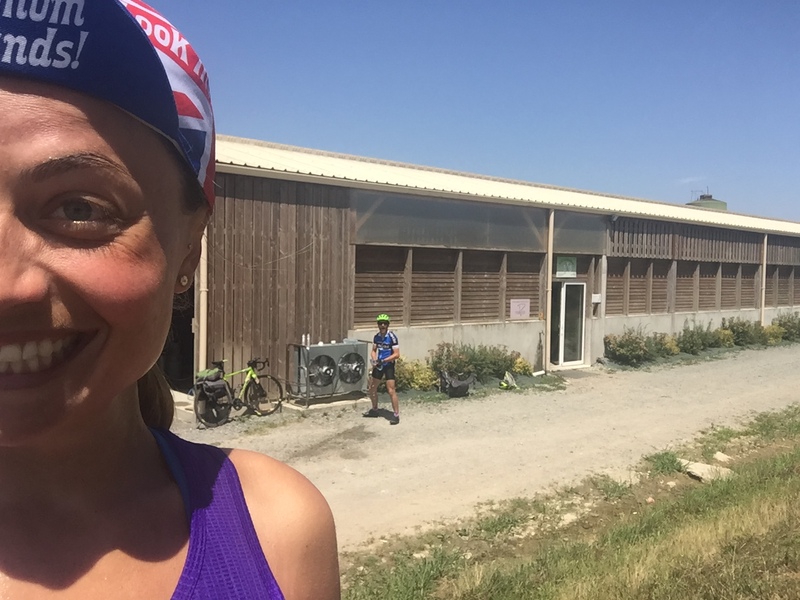 Passing through the beautiful town of Niort, we knew we were getting so very close to our final destination and to keep ourselves going, decided to stop wherever 100km was to celebrate, chill and eat some pizza we had stashed in our bags which was probably cooked to perfection from the heat. Oh yeah, let’s hang out in a cemetery. Why? Because they have taps! After celebrating at 100km and speaking about how feral I felt, we pushed on knowing we were only a few hours away from Annepont. We passed beautiful sunflower fields and watched the sun go down and as we approached our final few km’s, got stuck behind a tractor. I didn’t even care, I was feeling good, happy and just overwhelmed that we had made it from London to Annepont and all for my friends Mandy’s wedding to Chris – I was so chuffed! We had made it! What a feeling. Everyone was so welcoming and asked what we wanted first; shower, food or a drink. I literally wanted everything all at once! The chateau was beautiful, picturesque and had that day-before-wedding buzz feel about it. It was amazing to see my friends and the bride to be. Even though it was around 9pm, people wanted to hear all about our journey and were pouring us beers and asking questions left right and centre. It was an uunbelievablefeeling and one that I will never forget. Mandy and Chris – the wedding day! After a well-earned rest, I was up and excited for the day’s celebrations ahead. Even though I felt exhausted, I was buzzing from all the excitement and still processing the 4 day’s riding I had just done. I was one of the bridesmaids, along with my best friends, some of which I have known since the age of 3. Mandy was the most relaxed bride I have ever seen and this made us bridesmaids feel chilled and able to enjoy every moment. Everything about the wedding was perfect. Great company, well organised, beautiful weather, fantastic entertainment and local food and drink. I had a blast and was so honoured and grateful to have been part of it. Memories I will cherish forever. Thank you Mandy and Chris and to the Talbot’s and Barton’s for their endless hospitality! To see the full Strava ride click here. Click here to read Kieron Ramsay’s blog write up on day 5 – Never Break The Chain. If you’re inspired by my human-powered year-long Powered by Me journey, why not donate to July’s charity, Right to Play UK who help vulnerable children overcome poverty, war and disease through the power of sport and play. Donate to Right to Play UK now via my Just Giving page here, or text PBME77 to 70070, followed by the amount you want to donate.